If you want to learn Italian in a fun and entertaining way, then keep reading.... The truth is...the traditional classroom-style method used to learn a foreign language isn’t really that good. Memorizing dozens (or even hundreds) of grammar rules it’s hard, and remembering them while you’re in an actual conversation is even harder. But think about it. How did you learn your first language? Did someone give you a grammar book while you were still in the baby cradle? Or did you learn to speak by simply listening to others? Do you know what the hardest thing for an Italian learner is? Finding the proper learning material that they can handle...which is precisely the reason we’ve created this book! Teachers love giving out tough, expert-level literature to their students, books that present many new problems to the learner and force them to search for words in a dictionary every five minutes. It's not entertaining, useful, or motivating for the student at all, and many soon give up on learning! 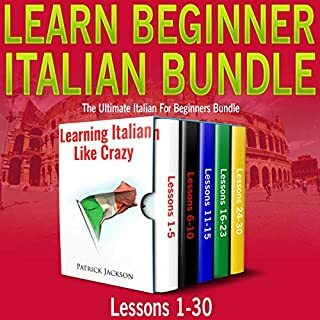 We have compiled 20 easy-listening, compelling, and fun stories to allow you to expand your vocabulary and give you the tools to improve your grasp of the wonderful Italian language. 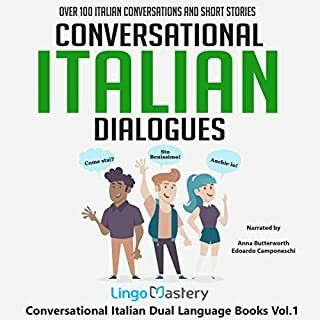 Each story will involve an important lesson of the tools in the Italian language (verbs, adjectives, tense, giving directions, and more), involving an interesting and entertaining story with realistic dialogues and day-to-day situations. The summaries follow a synopsis in Italian and in English of what you just heard, both to review the lesson and for you to see if you understood what the tale was about. At the end of those summaries, you'll be provided with a list of the most relevant vocabulary involved in the lesson, as well as slang and sayings that you may not have understood at first glance! Finally, you'll be provided with a set of tricky questions in Italian, providing you with the chance to prove that you learned something in the story. Don't worry if you don't know the answer to any - we will provide them immediately after, but no cheating! So look no further! 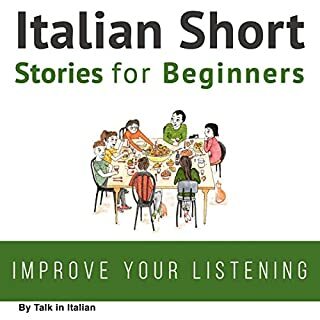 Pick up your copy of Italian Short Stories for Beginners, and start learning Italian right now! 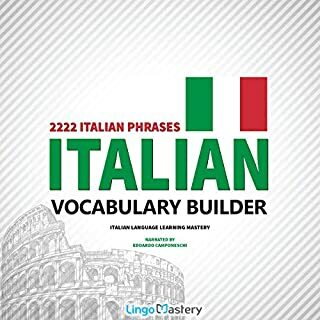 I've been learning Italian with Lingo Mastery - Italian Vocabulary Builder so I thought I'd give this book a shot. Although I'm not quite fluent after only two months of learning, I was able to follow the stories in this book easier than I thought. I found having this book is helping me with the other. If you're trying to learn Italian then this book will be a good thing to get. It really helps to hear in context what you're learning. The narration is well done. Italian Short Stories for Beginners: 20 Captivating Short Stories. It works my Italian is improving and at the first story I really struggled, but as the book continues it does get easier. A wonderful idea to help with learning Italian. Fast way to learn Italian. I love the stories in this book. They are carefully selected to be engaging, yet informative. The whole point is to use common words in the Italian language within a fun context. Although, I had a little bit of Italian knowledge (still beginner level though), this book served as a great resource for improving my comprehension, especially through the exercises. This is a very useful and interesting book. Language skills are difficult to obtain from written books, and I think audiobooks are a much better format. Even better than simply rote vocabulary are setting words in context, using stories to engage the reader. This series of Italian short stories has been a great way for me to immerse myself in the language, puzzling out not just how individual verbs are conjugated, but how Italian itself flows and structures itself. This series of short stories is a fantastic way to pass my commute. Highly recommended. 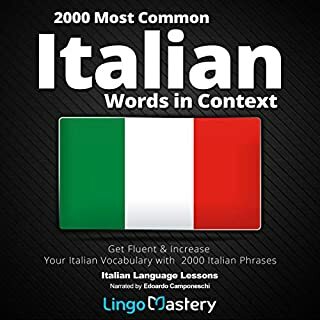 It was an interesting listen and very helpful with phrases and stories that will have you master Italian like a native. The voice-over performer was quite fluent and very good and patient when he was going back and forth with the easy translations and what they mean. So when you get a chance pick up a copy and enjoy. I got this audible for free with another Italian audio program. The other program is for beginners of the Italian language. I got them both free in exchange for an honest review. 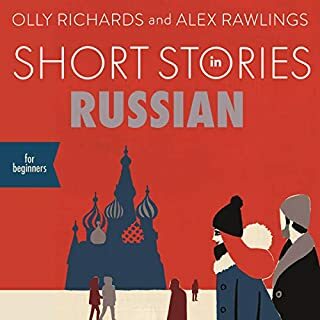 Concerning this audible, without a doubt, I enjoyed learning Italian with these short stories. What I like most is that I am learning Italian grammar and Italian vocabulary in a fun way - which is by listening to stories. Do not forget to do the short quizzes to test your progress and reinforce all of the Italian you will be learning from these short stories. This audiobook and its PDF have a lot of vocabulary and various tenses to learn from. I enjoyed it. I cannot speak to errors in the book, or if there are any, but my Italian has improved substantially in what I can say and understand. I like using an app that gives rapid translations of the text which allowed this book to be useful to me even though I've only been learning for a few months. My Italian tutor and friends have all remarked at my improved speech and comprehension. I would say the level of the stories is aimed at about 10 year olds, good for beginners. It was lots of fun. Recommended but you must have a good and friendly Italian tutor as well as some means of rapidly translating the text so you don't get stuck. The only thing I don't like is that each story takes up 4 chapters of the audiobook. This makes is challenging to find the transcript for each story. Great idea. 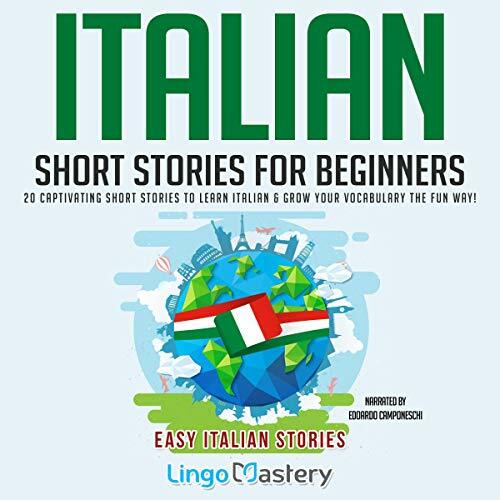 Short stories with chapters to help you learn the phrases, spoken in both English and Italian, with little tests at the end. I wouldn't say the stories are very entertaining and I'd beware if you're a beginner. I ve been trying to learn for a few years and find this quite advanced. Its at least intermediate. I'll.stick with it though as repetitive listening is the key to learning.